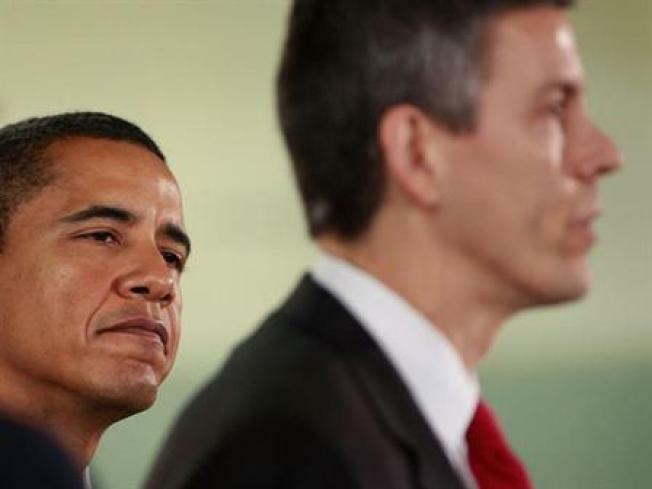 Read the full prepared remarks of President-elect Barack Obama as he nominates Arne Duncan as Secretary of Education. Over the past few weeks, Vice President-elect Biden and I have announced key members of our economic team, and they are working as we speak to craft a recovery program that will save and create millions of jobs and grow our struggling economy. But we know that in the long run, the path to jobs and growth begins in America’s classrooms. So today, we’re pleased to announce the leader of our education team, whose work will be critical to these efforts: our nominee for Secretary of Education, Arne Duncan. When it comes to school reform, Arne is the most hands-on of hands-on practitioners. For Arne, school reform isn’t just a theory in a book – it’s the cause of his life. And the results aren’t just about test scores or statistics, but about whether our children are developing the skills they need to compete with any worker in the world for any job. When faced with tough decisions, Arne doesn’t blink. He’s not beholden to any one ideology – and he doesn’t hesitate for one minute to do what needs to be done. He’s worked tirelessly to improve teacher quality, increasing the number of master teachers who’ve completed a rigorous national certification process from 11 to just shy of 1,200, and rewarding school leaders and teachers for gains in student achievement. He’s championed good charter schools – even when it was controversial. He’s shut down failing schools and replaced their entire staffs – even when it was unpopular. Dodge Renaissance Academy is a perfect example – since this school was revamped and re-opened in 2003, the number of students meeting state standards has more than tripled. In just seven years, he’s boosted elementary test scores here in Chicago from 38 percent of students meeting the standards to 67 percent. The dropout rate has gone down every year he’s been in charge. And on the ACT, the gains of Chicago students have been twice as big as those for students in the rest of the state. So when Arne speaks to educators across America, it won’t be from up in some ivory tower, but from the lessons he’s learned during his years changing our schools from the bottom up. I remember a conversation we had about one of those lessons a while back. We were talking about how he’d managed to increase the number of kids taking and passing AP courses in Chicago over the last few years. And he told me that in the end, the kids weren’t any smarter than they were three years ago; our expectations for them were just higher. Well, I think it’s time we raised expectations for our kids all across this country and built schools that meet – and exceed – those expectations. As the husband and brother of educators, the Vice President-Elect and I know this won’t be easy – we’ve seen how hard Jill and Maya work every day. And we know it’s going to take all of us, working together. Because in the end, responsibility for our children’s success doesn’t start in Washington. It starts in our homes and our families. No education policy can replace a parent who makes sure a child gets to school on time, or helps with homework and attends those parent-teacher conferences. No government program can turn off the TV, or put away the video games and read to a child at night. We all need to be part of the solution. We all have a stake in the future of our children. I’ll never forget my first visit to this school several years ago, when one of the teachers here told me about what she called the “These Kids Syndrome” – our willingness to find a million excuses for why “these kids” can’t learn – how “these kids” come from tough neighborhoods, or “these kids” have fallen too far behind. I can’t think of a better way to sum up Arne’s approach to education reform. With his leadership, I am confident that together, we will bring our education system – and our economy – into the 21st century, and give all our kids the chance to succeed.